ARE THESE THE WORST ZX SPECTRUM GAMES EVER? Be prepared to be feast your eyes on some of the most ill-conceived and poorly programmed games ever made for the ZX Spectrum. There's dire animation, flickering graphics and even stolen code. Yes, even the games that you typed in from computer magazines were better than this! Butterfly (1984) - Pulsonic. What an ill-conceived idea for a game. You play the role of a spider and must simply catch a butterfly - that's about it really. The graphics are truly abysmal and the animation is non-existent. Watch out for the giant pac-man which suddenly appears out of nowhere - what lazy programming! Simplyeighties.com is a participant in the Amazon Associates and Redbubble.com affiliate programs which allow us to earn advertising fees by linking to products at amazon.co.uk and redbubble.com. Kung Fu Knights (1988) - Top Ten Software. Well, the graphics don't seem to bad at first glace. However, on playing the game you see that the knight walks like he has a wooden leg. Fire arrows at your enemies and they disappear (along with the enemy) long before they make contact. The disastrous collision detection makes for very unappealing gameplay. Krazy Kong (1982) - C-Tech. Now, is that supposed to be a gorilla? The guy that the player controls looks like he's been bound with rope and has to hop around the screen because the programmer doesn't appear to know how to add animation. With all that flickering, lousy animation and terrible gameplay is this the worst Donkey Kong clone ever? Bunny (1983) - Automata UK Ltd. Once again there is no animation for the characters - that's lazy programming. The whole concept of the game is just abysmal - move around an almost bare pathway collecting carrots that appear out of nowhere. It's truly gripping stuff and is guaranteed to make you hopping mad! The pathway could, at least, have been a maze to make it challenging. Crimebusters 1986) - IJK Software. Well, it's visually more appealing than the other games featured here, but that's mainly because the programmer, Harry Price, stole the code from the game Spellbound to create Crimebusters, apparently. It looks as awkward as hell to play, if not impossible. The publishers comitted a crime by expecting people to fork out for a rubbish game that was a blatant rip-off of a decent one! Boat Run - unpublished. Yes, to be fair this game was never published, and it's a darn good job, too! Guide a flickering boat through a narrow, graphically unimpressive river for 15 seconds and you're done! Ever seen a rocket-powered Sinclair C5? Gobbler (1982) - Saturnsoft. If you thought the Atari 2600 version of Pac-Man was bad, then feast your eyes on this - it's a flickering nightmare! This is a painfully slow game and watch how the gobbler man sometimes goes right through the ghosts with no collision detection. Amusingly, the question "Play again?" is displayed on the screen at the end - are you joking? SQIJ (1987) - The Power House. What on earth is going on in this game? 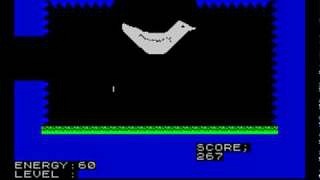 All I can make out is that you control a giant bird in the centre of the screen which moves at a snails pace, randomly leaving pixels on the screen due to abysmal programming. I've no idea what the objects are or what you're supposed to be actually doing with them? At one point, dire animation techniques leave part of the bird on the screen. It surely doesn't get any worse than this? Kosmik Pirate (1984) - Elephant Software. Erm, it does get worse! The inlay card has the audacity to claim that the game "represents excitement for all the family". How can anyone possibly get excited by this load of old nonsense? There's more excitement to be had peeling the stickers off a Rubik's cube.